Florence + The Machine, CHVRCHES, Primal Scream and more among names confirmed for this year’s Edinburgh Summer Sessions! 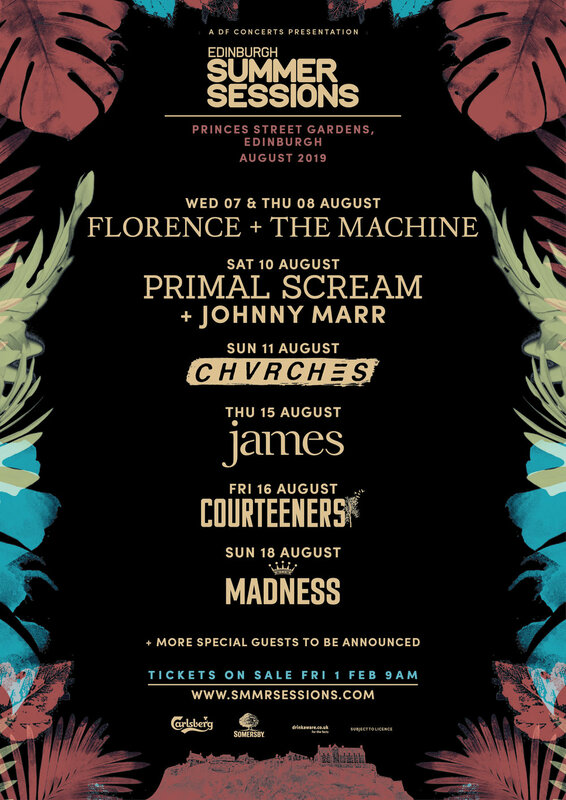 Edinburgh Summer Sessions Festival organisers DF Concerts are thrilled to reveal Florence + the Machine, CHVRCHES, James, Courteeners, Madness, Primal Scream and Johnny Marr will play festival shows across seven dates during Edinburgh International Festival this summer. The line-up features trailblazing female talent and iconic greats, all taking place against the incredible backdrop of Edinburgh Castle in the Ross Bandstand. Making a much-welcomed return to Scotland, Florence + The Machine will open Edinburgh Summer Sessions in 2019 playing not one but two consecutive shows on 7th and 8th August. 2018 was a remarkable year for Florence Welch, whose fourth album ‘High As Hope’ was released to wide acclaim in what felt like a career-defining moment. She received her third Mercury Prize nomination for the record and more recently has been shortlisted for both an ‘Album Of The Year’ and ‘British Female Solo Artist’ in this years’ BRITS nominations. Edinburgh Summer Sessions Festival cannot wait to welcome Florence + the Machine to the Edinburgh stage this summer in what will be an unforgettable opening show. Primal Scream will take to the Edinburgh Summer Sessions Festival stage on 10th August, their first Scottish date since the iconic V+A opening in Dundee last summer. Primal Scream released the original studio recordings from Memphis of the tracks that eventually became their 1994 album ‘Give Out But Don’t Give Up’ in October last year. They teamed up with legendary producer Tom Dowd and the Muscle Shoals rhythm section of David Hood (bass) and Roger Hawkins (drums) at Ardent Studios in Memphis, the resulting recordings from those classic sessions showcase the more country soul, rock’n’roll side to a band who continue to surprise. The early 1980s weren’t the best of times to be an aspiring guitar player. Born in Manchester on Halloween 1963, of Irish heritage, Johnny Marr’s earliest musical memories are the get-togethers of his extended family, perhaps - as his early guitar idol Marc Bolan would sing - dancing himself out of the womb to the traditional strains of Black Velvet Band. With a career quite like no other, Johnny Marr is a musical genius creating a guitar sound with The Smiths that today, is still one of the most iconic in British history. Johnny Marr has reaped the rewards of a hugely successful solo career playing huge shows in Scotland, most recently a legendary show at the famous Glasgow Barrowlands. Johnny Marr has also worked with a plethora of incredible artists in his time, joining bands including Modest Mouse and The Smiths. He’ll be sharing the Edinburgh Summer Sessions stage supporting Primal Scream on 10th August, a date that is sure to rock the hearts of lovers of great music around Scotland. Synth-pop maestros CHVRCHES will make their debut at Edinburgh Summer Sessions on 11th August, almost five years since their last performance in the capital. After a special homecoming performance at TRNSMT Festival in their hometown last summer, the Glasgow trio fronted by Lauren Mayberry, will return to Scotland after an incredible seven years of huge tunes and big shows around the world. Their debut album in 2013 proved CHVRCHES were turning the Scottish music scene on its head, blending Lauren’s mesmerising vocals with catchy indie-pop hooks and lyrics. 2018 saw the band release their third album ‘Love Is Dead’ showcasing hits like ‘Get Out’ and ‘My Enemy’, strengthening their roots as leaders of Glasgow, and Scotland’s, music community. With a massive show at The SSE Hydro on the cards next month, the Edinburgh Summer Sessions date is a unique chance to catch CHVRCHES in the capital with the beautiful backdrop of the City’s most iconic landmark. Also on the line-up, one of Britain’s most celebrated and enduring bands, James are set to take the stage at this year’s Edinburgh Summer Sessions Festival on 15th August. Having sold more than 25 million albums worldwide, the band are no strangers to creating iconic music that comes alive on stage. James released their 15th studio album ‘Living in Extraordinary Times’ last year living up to their new mantra; extraordinary times calls for extraordinary music. It debuted Top 10 and received critical acclaim and may be their best album yet! The band will no doubt bring these incendiary new songs and some of their classics of the past three decades to Edinburgh Summer Sessions in what is set to be a truly extraordinary gig for the legendary band. Described as “One of the best live British bands of the moment” by Clash Music, the Courteeners will play Edinburgh Summer Sessions Festival on 16th August following on from their amazing performance at TRNSMT Festival in 2018. More than a decade of tours, epic anthems and five studio albums reached its peak for Courteeners in summer 2017 as the band played the biggest show of their career - a huge sold-out 50,000 capacity at Manchester’s Emirates Old Trafford. And there’s no stopping them with 50,000 tickets selling out in a matter of hours for their Heaton Park concert this summer in their hometown. The band's alternately jangly and bombastic brand of indie guitar rock lends itself to festival stages around the world. With big tunes from the debut record including ‘Not Nineteen Forever’ and ‘What Took You So Long?’ carved out as pure guitar–rock classics, Courteeners’ appearance at Edinburgh Summer Sessions will be sure to bring hero singalongs from that first guitar hook. 2019 is Madness 40 Anniversary where everything will be XL and by some strange coincidence, it is also 40 years since they played at Glasgow’s Barrowlands. It seems only fitting that the band mark these anniversaries by making their debut at Princes Street Gardens in Edinburgh on 18th August. The pop band are known for their entertaining, fun-loving performances and endlessly catchy songs. With 24 top twenty hits, 4 Gold studio albums and 2 Ivor Novello Awards, it is no surprise that Madness are considered one of the most successful bands in the UK. We can expect big, bold sounds and sax solos at Edinburgh Summer Sessions as Madness play all their classic hits from ‘House of Fun’ to ‘Baggy Trousers’ to ‘One Step Beyond’. Part of the Summer Sessions Festival family, Edinburgh’s event will open up proceedings for Glasgow’s tremendous series of festival dates starting on 16th August with a Scottish return by The Cure who are joined by a huge line-up featuring Mogwai, The Twilight Sad and The Joy Formidable. A sold-out show from the Foo Fighters is on the cards in Glasgow’s Bellahouston Park on 17th August, followed by the outstanding The 1975 who will be joined by Twin Atlantic, You Me At Six, Pale Waves, Ten Tonnes and No Rome on 25th August, rounding off a huge summer of music for Scotland. “We’re delighted to be bringing the Edinburgh Summer Sessions back to Princes Street Gardens this year. 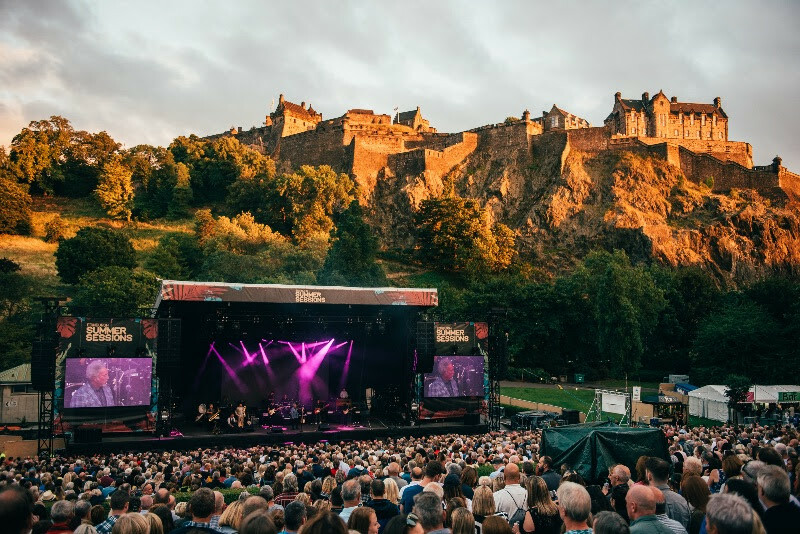 The inaugural festival in 2018 was very well received and saw some world-class acts like Tom Jones, Paloma Faith and Kasabian play with the stunning backdrop of Edinburgh Castle in what is Scotland’s concert equivalent of the Hollywood Bowl. “What a fantastic line-up for this year’s Edinburgh Summer Sessions. We look forward to welcoming music fans from near and far to celebrate music and the wider festivals offering in our beautiful West Princes Street Gardens. We know that performing against one of the world’s iconic skylines set against the Castle meant a lot to the artists and the audiences.